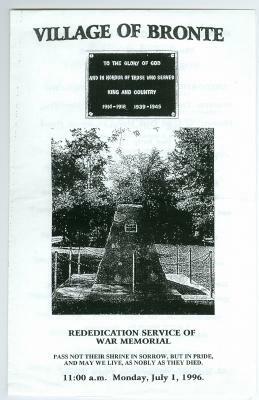 There was a dedication service for this war memorial when after it was installed on July 22nd, 1956, followed by a rededication service on July 1st, 1996. Before this rededication, there was a period of time when the cenotaph plaque was missing. Over the years the cenotaph had been vandalized and it appeared that someone had ripped the plaque out of it. The cenotaph was eventually refurbished and a new plaque was put in. 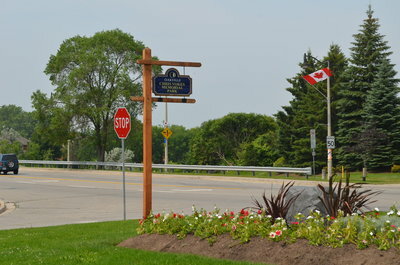 Three of four years later, according to Past President Gene Reed, a UPS driver found the stolen plaque on MacDonald Road in Oakville. He gave it to someone who owned a military museum in Oakville, who then brought it to the Legion and asked Gene if he knew what it was. 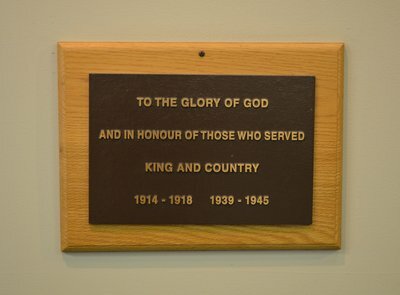 To this day, no one knows how that plaque made its way to MacDonald Road, but it’s now mounted on the wall of the Club Room at the Bronte Legion. 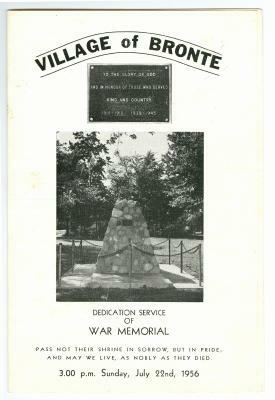 While the cenotaph at Bronte Gore Park still remains, a new, larger cenotaph was built down the road at Chris Vokes Memorial Park. 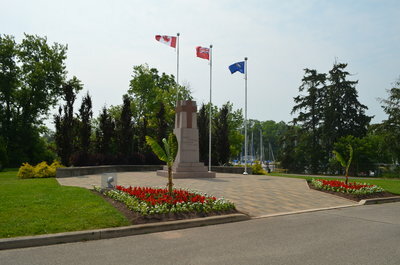 Remembrance Day ceremonies take place at this cenotaph each year on November 11th. This cenotaph is dedicated to those who served in the First World War, Second World War, and the Korean War. HALINET, Appleby College, Bronte Historical Society, and Private Collections.